For centuries there has been a tenuous peace through the ruins of the Corinthian Empire. One bought with the blood of countless thousands, and floundering in the shadows of a cold war fueled by magic, faith, and dragons. The memory of mages may be long, but time brings complacency, and ambition is a wolf ever circling at the door. Three children are cast into the royal court of the small western kingdom of Avrale. A land caught between the true power brokers of their world. Yet the forces of fate spiraling around the Ashton children hint at a larger picture. That nothing about them is at all ordinary, even if all they want is to live their lives, and find their place in a world that seems to always have other plans. They will learn that gifts can be burdens, and that great power is never without consequence. Order and Entropy has not been tagged yet. Help others find Order and Entropy by tagging it! 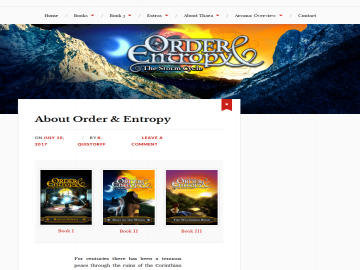 Order and Entropy has not been reviewed yet. Order and Entropy has not been recommended yet.